It’s not every day you get to impress the jaded technology nerds in downtown San Jose (“the Capital of Silicon Valley”). It’s doubly hard when ESC – oops, the DesignWest conference – is in town and 90% of the populace is showing off their latest seamless multicore hybrid open-source whatever. And it’s rarer still to be blowing them all away on public roads. Say hello to my little friend, eRex. 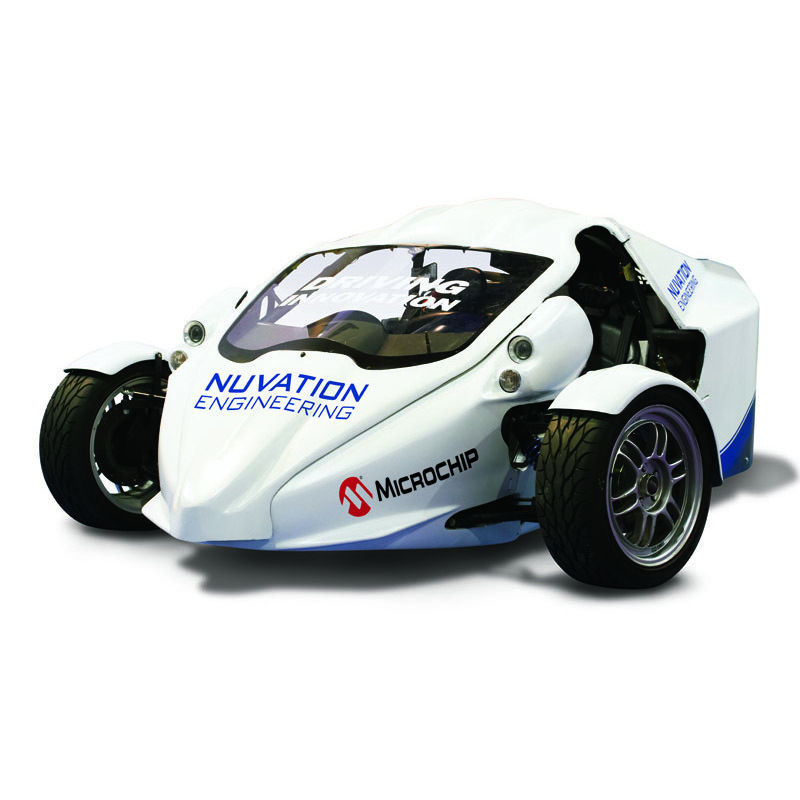 For those of you poor, sad readers who haven’t seen it, eRex is an electric racecar built by Nuvation, a Canadian/American design firm and one of the exhibitors at DesignWest. And it’s pretty darned cool. It’s also, not incidentally, a rolling advertisement for Nuvation’s design services. The company doesn’t make electric cars, per se. They rent themselves out as a contract-engineering service, helping clients solve thorny hardware, software, or integration projects. Think of them as outsourced engineering but with native English speakers. I spent some quality time with Nuvation’s CEO and chief engineer, Michael Worry, and his company’s creation. Most demos at DesignWest involve prototype boards, blinking LEDs, laptops with hard-to-describe CAD software, and audience-friendly speakers barking out PowerPoint presentations. Nuvation’s demo involves heading outside to the parking lot where eRex had already drawn a crowd. Engineers in khakis, visiting tourists, and one presumably homeless man with a shopping cart full of detritus all surrounded the car and peppered Michael with questions. I got to stand around with my hands in my pockets, acting like I belonged there and flashing enigmatic smiles should anyone mistakenly direct a question my way. Hey, I’m just a tourist here, too, folks. Nuvation’s eRex is an interesting beast. (You can read about it in the company’s blog, here.) It’s a hybrid in the original sense, meaning it’s a combination of designs taken from elsewhere and grafted together. The chassis started life as a legitimate road vehicle called T-Rex, manufactured by Compagna Motors. The T-Rex is a three-wheeled car/motorcycle (different jurisdictions classify it differently) that’s normally powered by a four-cylinder 1.4-liter engine. The tricycle chassis has two front wheels for stability and one rear wheel connected via chain drive to the conventional engine. That’s in T-Rex trim. Nuvation gutted all that and replaced the internal-combustion engine with an electric motor and a big stack of batteries. The 800-pound conversion weighs more than the gas engine it replaces, so Nuvation also beefed up the chassis, widening the rear mounts and stiffening the dampers. While they were at it, Nuvation also designed a fiberglass roof to go over the two-person cockpit, something the stock T-Rex doesn’t offer. Naturally, the electric conversion is called eRex. Building an electric vehicle isn’t as simple as just hooking up some AA cells to a motor and throwing the switch, and that was the impetus behind Nuvation’s eRex project. The company wanted to establish its battery-management bona fides, but without a big client like Tesla or Chevrolet to point to, the company had a tough time convincing potential customers that it knew what it was doing. Hence, eRex. Design the car, drive it around, and show the world what you can do. And boy, howdy, does it work. Standing next to it, you realize that the roof of eRex only comes up to your belt. It looks about as sturdy as a shopping cart, albeit a really cool, aerodynamic shopping cart. The hardtop conversion is a bit of a mixed blessing. On the one hand, it keeps the wind out of your hair and the bugs out of your teeth, but it also make ingress and egress a bit… undignified. Experience has taught Michael the value of demonstrating to journalistic newcomers the proper way to enter the passenger seat. Otherwise, the poor scribes tend to injure themselves. Whether by luck or careful craft, I managed to hop in with a minimum of fuss (all those years of climbing into racecars may have finally given me a useful skill), while Michael did his preflight check. Nuvation’s control system comes in two parts: There’s the battery-pack manager, which looks after individual batteries or stacks of batteries. On eRex, there are nine of these units strapped to the left and right flanks of the car. With their exposed “heartbeat” LEDs, the battery managers give eRex the feel of hijacked Cylon technology and clearly indicate – as if the exposed wiring didn’t give it away – that this is no ordinary vehicle. The second part is the battery–management system (BMS), the central point for all the control electronics. The BMS is connected via optical link to the battery pack (“PackMan”) units. The car’s throttle, instruments, and regenerative braking are all inputs to the BMS. There’s no throttle cable in the traditional sense because, hey, no throttle. Both BMS and PackMan use Microchip PIC microcontrollers, which is remarkable if you think about how much work these units have to do. With more than a hundred batteries propelling eRex, there’s a lot of heat, voltage, and current management to do, all of it in real-time. While Michael drove and I sat in the passenger seat trying not to squeal, I amused myself with the onboard battery-monitoring system that gives constant updates on the health of each cell. During hard acceleration, their voltage dropped ever so slightly. Regenerative braking topped them up again. It’s a remarkable thing to actually watch while also being propelled down the freeway at super-legal speeds. So what’s the car like to drive? For starters, it sits about three inches above the ground, so it’s a bit like being in a rocket-propelled roller skate. You learn to identify other vehicles – a Toyota Camry, for example – by their hubcaps. Larger vehicles and delivery trucks appear in your field of view as exhaust pipes. The ride is stiff, but not bone-jarringly so. And you have an unobstructed view of your front wheels. If you ever thought of your car’s tires as just generic black doughnuts, eRex gives you a whole new appreciation for what tires really do all day. Goggles are recommended but not required. And don’t bother combing your hair. After our trip, Nuvation’s enchanting EE/PR hybrid Lindsay Farlow burst out laughing and made us promise not to comb our hair until after she’d taken a picture. eRex certainly leaves a lasting impression! Love that car!